Product prices and availability are accurate as of 2019-04-20 17:51:32 UTC and are subject to change. Any price and availability information displayed on http://www.amazon.com/ at the time of purchase will apply to the purchase of this product. 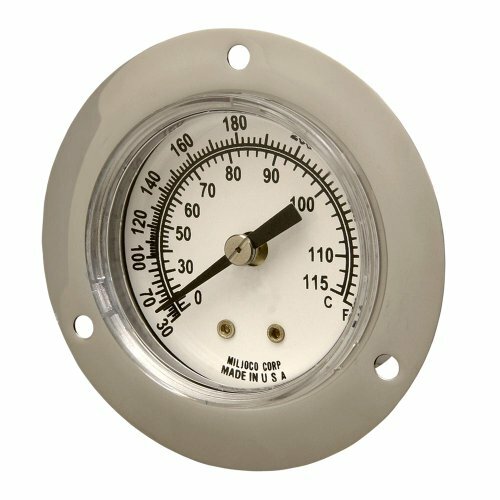 Miljoco vapor dial thermometers are manufactured to the highest standards for a wide range of uses and may be fitted into almost any temperature reading application. These instruments are ideal for obtaining readings from remote locations. Being vapor actuated, they are not subject to any ambient temperature variations along the tube system and give excellent readings both above and below ambient. Vapor instruments have progressive graduations and are best read in the upper two-thirds of the range. Front flange thermometers are designed to be installed in a panel using three screws from the front. Miljoco thermometers are listed by NSF for use in the food service industry. Flush mount - front flange case. Rear outlet.